Jordan Hamilton pulls up for a jumper. The freshman guard will be tasked with a difficult role in Wednesday’s game at Ohio State. Coach Joe McKeown said he knew changes had to be made. Not long into the season, he adjusted the role of film sessions and put aside the fine print in the scouting reports. In his tenth season at Northwestern, with what he said is the most inexperienced team he’s coached, McKeown and the staff are mostly taking on the bulk of game preparation and giving their players fewer details to agonize over. So when he meets with freshman guard Jordan Hamilton, instead of analyzing her defense or breaking down where she is efficient from on the floor, McKeown said he tells her he just wants her to play her game. McKeown said this free-flowing philosophy gives the Wildcats (10-18, 3-11 Big Ten) their best chance to beat No. 14 Ohio State (22-6, 11-3). Preparing to face last season’s conference champions and two-time Big Ten Player of the Year Kelsey Mitchell, McKeown’s message to his team is straightforward — commit fewer than 12 turnovers, out-rebound the Buckeyes and contain them in transition. But the Cats turn the ball over on 20 percent of their possessions, are one of the least effective offensive rebounding teams in the NCAA and play at an extremely slow pace, averaging less than 68 possessions per 40 minutes. For a team starting two freshmen and two upperclassmen who didn’t play significant roles last season, Hamilton said the simplistic approach makes it easier for her to stay in the moment. 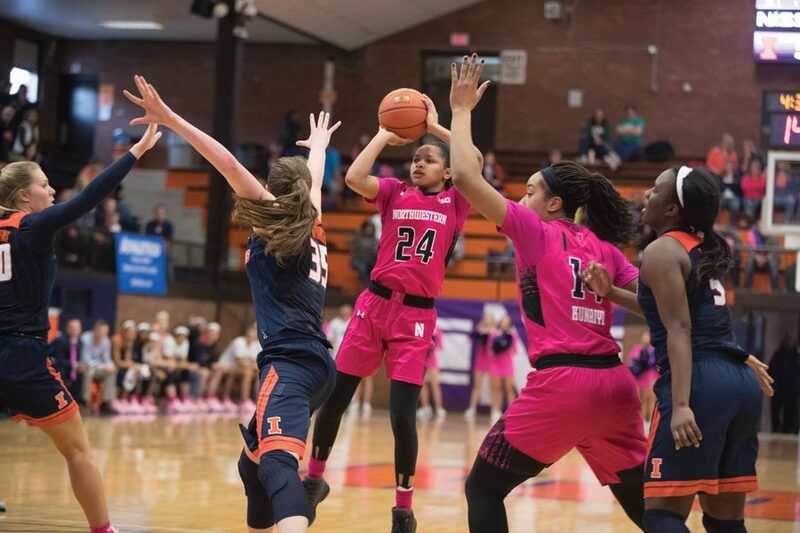 McKeown recruited Hamilton to provide a scoring punch as an athletic guard, and he said he’s been playing her out of position as NU’s primary ball handler. Likewise, sophomore forward Bryana Hopkins, expected to come off the bench as a defensive specialist, led the Cats in scoring with 15 points against Illinois and has started 12 of their 14 conference games. But the Buckeyes, who have the fourth-best scoring offense in the country and play at one of its fastest tempos, have won their last six conference games all by double digits. They might be the most difficult opponent NU has faced all season. In the team’s last road game before next week’s Big Ten Tournament, McKeown said Ohio State’s pace will force the Cats to adjust their style of play. He’s most curious to see how his young core responds.